The Last First Sergeant Web Site - "Epilogue"
. . . Then there was a tune that had great private meaning, helping to sustain me, a lonely soldier, when times were grim. "When they begin the Beguine, let them play till the stars return above you." She was the love of my life. Oh, to dance so close. To hear those lines over and over in my mind was to remember why I must come back. 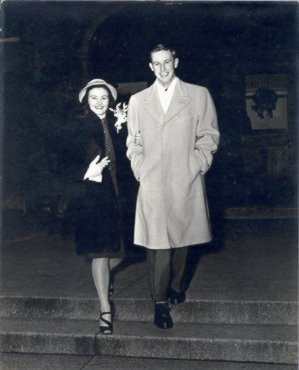 Layton and Jeanne leaving their wedding reception January 13, 1946. What have I done since the war? Married that girl, raised two boys, enjoyed two grandkids, farmed for fifty years, worked in the lumber (retail) business twenty years and somewhere in there broadcast high school football and basketball over the radio. Hell, all of that was easy after what I had been through. And it was fun. Please, God, tell all those wonderful men who missed out on the last fifty years that I have never forgotten them. Airborne all the way. Layton Black, Jr.
Point the mouse and click to see the pages listed below.